Oh my gosh I cannot believe that it is already time for another cake for the Cake Slice Bakers group! We are a group of bakers who are currently baking from Maida Heatter’s Cakes. This months choices were a Sand Torte, Jelly Roll, Oreo Cookie Cake and Blueberry Muffins. Last month I chose to make my first ever Bundt cake and I was thrilled with how it turned out. I debated this month if I should do another one so soon but I couldn’t resist the pull of cookies and cream! Needless to say, I’m keeping this post short and sweet. I will tell you however that I missed a few spots when buttering the Bundt pan and out it crashed with massive chunks missing. I was devastated and amused at the same time but I had to laugh it off. Pictures are definitely lacking because of my little incident but I at least was able to drizzle the glaze over part of the cake. Don’t forget to check our all of the June selections from the Cake Slice Bakers! 1. Adjust oven rack one-third up from the bottom of oven and preheat oven to 350 degrees. Generously butter a 10-inch (12-14 cup capacity) Bundt pan and dust with flour. 2. 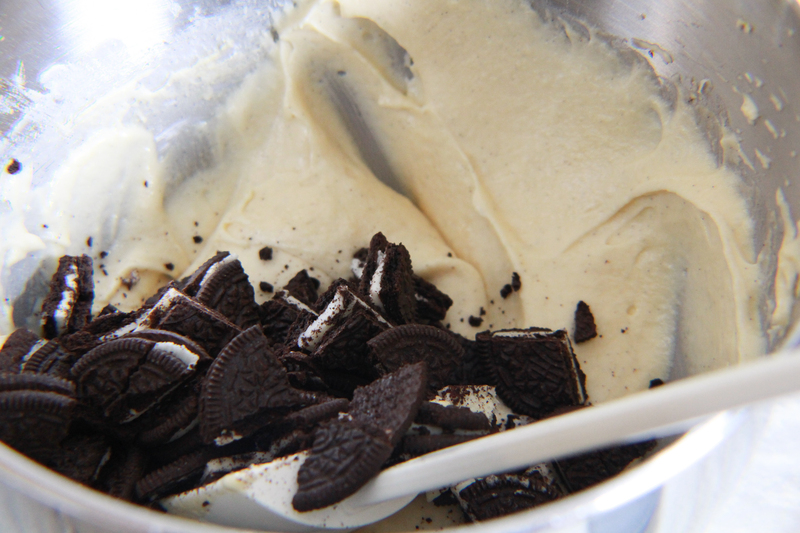 With a sharp knife, chop the Oreo’s into quarters and set aside. 3. In a medium bowl, sift the flour, baking soda and salt and set aside. 4. In a large bowl of electric mixer, beat the butter until soft. Add the vanilla, almond extract and sugar and beat to mix well. 6. On low speed add the flour mixture in three batches, alternating with the sour cream. Scrape the bowl down as needed. 7. Spoon about 1.5 cups of the mixture into the bottom of the pan. Smooth and make a shallow trench. 8. 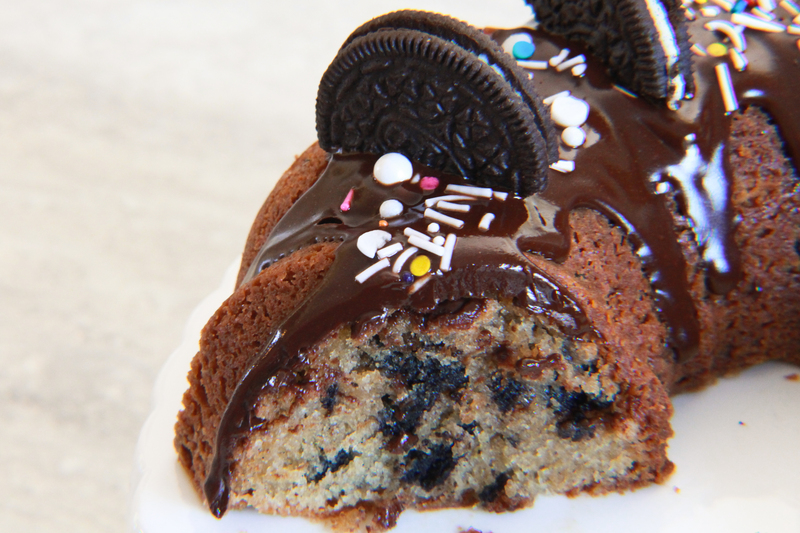 Gently fold the Oreo’s to the remaining batter and add to Bundt pan. Smooth the top. 9. Bake for 1 hour or until a cake tester comes out clean. Allow to cool for 15 minutes in the pan before inverting it onto a cooling rack. Let it completely cool before adding the glaze. 10. To make glaze, melt the chocolate chips and butter in a double boiler, whisking until smooth. 11. Carefully pour over the top of the Bundt cake and allow it to drip over the sides. Top with sprinkles and let the glaze harden for about 30 minutes. 12. Store and serve at room temperature. 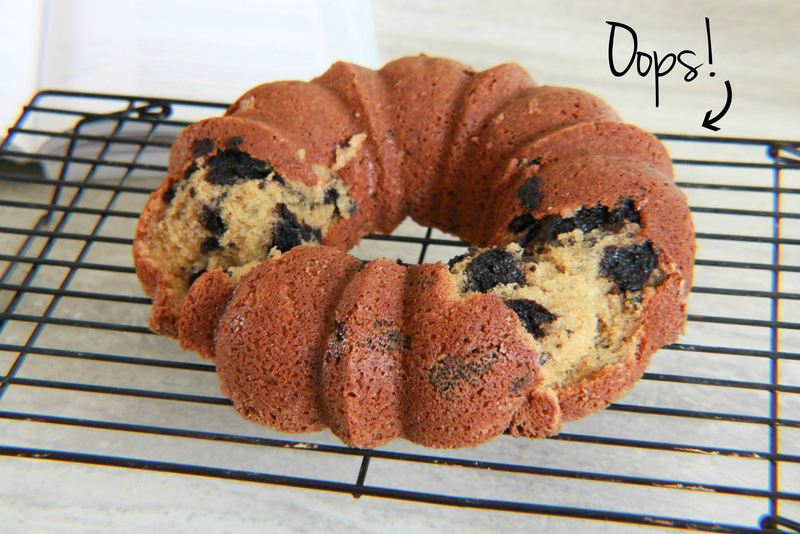 This entry was posted in Cakes & Cupcakes and tagged bundt cake, cake, Cookies, oreos, sprinkles. Bookmark the permalink. Ha! Too bad part of it stayed in the pan. It still looks absolutely delicious. I am a sucker for anything cookies and cream, so I’d line up for a piece! Oh, I hate it when I do that. However, the topping probably covered it well and it still tastes great. Right? I love the sprinkles you added to give it some color. Yes it was still delicious and the ruined parts were used as “samples”! A despite some of the cake staying in the pan you’ve still managed to make such a pretty looking cake Jolena. Very impressed! Despite some of the cake staying in the pan you’ve still managed to make a really pretty cake Jolena. Very impressed! 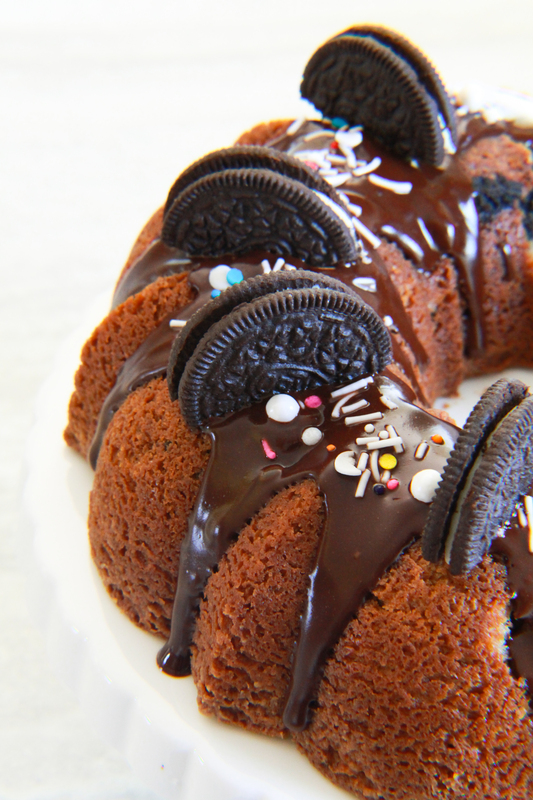 Despite the mishap you had with your cake…. you made it pretty again with the glaze, sprinkles and cookies in an orderly format! I like that the height of you cake is just right amount of cake and cookies! Now this cake looks delicious! My kids would have gone crazy over it!